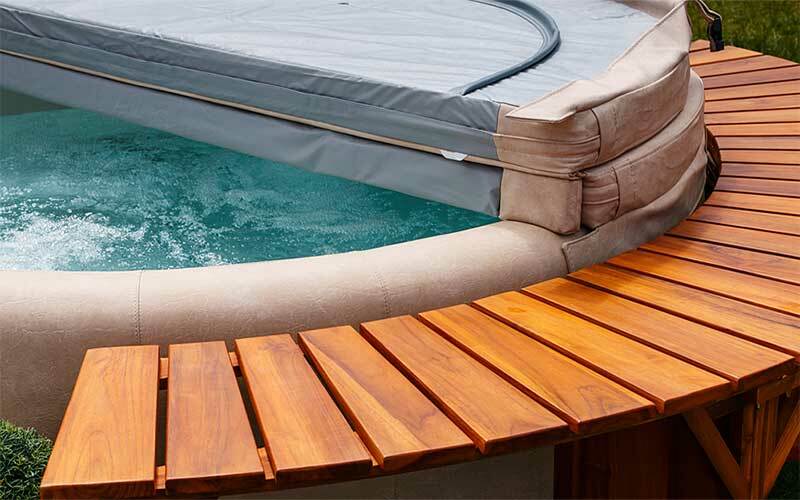 A hot tub cover is an important accessory that has many functions. In addition to saving you money, keeping children safe and debris out they also reduce the amount of time it takes to maintain your hot tub. They do need some care and attention to keep them in good condition but ultimately it's worth the time and effort. Whether you are in the market for a hot tub replacement cover, want to learn more about how to take care of a cover or you just want to learn a bit about them, we can help. We'll go over the benefits and functions of a quality cover, things to look for when purchasing a hot tub replacement cover and go over how to maintain a hot tub cover so your investment lasts for many years. The reason you use a hot tub cover go beyond keeping dirt and debris out of the water. It might even seem like a hassle to put it on and take it off every time you go for a relaxing soak. After reading this you will hopefully find it less of a headache and more of an important part of owning a hot tub. Whether you have children or not, you should find this information informative. We all want to save money and if you're like most hot tub owner's you probably try your best to conserve energy costs the best you can. A cover that is sized properly, has the proper foam density for insulation and is used at all times will reduce your operating costs substantially. Any time that your cover is not being used you are losing water due to evaporation, heat from radiant loss and with that comes the loss of chemicals. If you live or operate your hot tub in a cool or dry climate, the loss is even more substantial. The loss of water, heat and chemicals adds up over time and can be prevented with diligent cover use and a properly fitted hot tub cover. The most obvious reasons to use your cover at all times and purchase a hot tub replacement cover that fits is it will keep your hot tub clean. The list of debris that can end up in your water is endless but includes things like leaves, twigs, pollen, bugs and even rodents. Clean water means that you'll have to clean your hot tub filter less often and your chemistry won't fluctuate as much. If you have children that have access to the hot tub its important to have a securely fitting cover with a locking strap or latch. All children are curious by nature and preventing them from getting into the hot tub when they aren't supervised is very important for preventing accidental drowning. The ASTM provides standards for All Covers for Swimming Pools, Spas and Hot Tubs. The Pool & Hot Tub Council of Canada provides Hot Tub Safety Guidelines. In Australia the government outlines regulations for Covers and lids on spa pools. Your hot tub cover needs some care and attention. The more time you spend looking after your cover, with the help of some great products, the longer it will last and the better it will do its job. The easiest way to remember is to make it part of your regular hot tub maintenance routine. Clear the cover of debris as often as possible. It doesn't take long for debris to build up on a cover especially if it gets wet. Water and snow seem to act like sponges for anything that happens to fall or blown in the wind. A broom will work but a telescopic squeegee is perfect for keeping water and debris off and giving the cover a clean. Clean and protect the top of the cover. This should be carried out when you are balancing chemistry or draining your hot tub. With the cover completely removed, give it a spray with a protectant and cleaner. The UV hot tub protectant spray will prolong the life the vinyl, restore color and prevent ripping and tearing that can compromise the integrity of the cover. Treat the bottom of the cover with a disinfectant. A solution of vinegar and water can be used to wipe the bottom of the cover that is exposed to the hot tub. This will help prevent growth of mold, mildew and other nasty organisms. If your hot tub cover smells it probably means that you have mildew or mold growing on the underside of the cover. The worst case scenario is you have nasty stuff growing inside your cover, which means you will most likely have to purchase a replacement hot tub cover. It might be worth trying a disinfectant spray but you run the risk of developing chemistry problems if you don't eliminate the problem completely. If the cover is damaged in the form of a small rip or tear, it can probably be repaired by a handy hot tub owner. It should be patched immediately after it is allowed to dry out completely. The vinyl shell acts as a barrier to moisture and if it has been ripped or cracked for a long period of time, you may have compromised the interior of the cover. A hot tub cover vinyl repair kit is an affordable way to try to salvage your cover so you you don't have to buy a new one, yet. If you make the decision to repair the rip or tear, check the cover frequently to make sure that you don't notice any odors or growth of mold or mildew. There are some great accessories that will make it easier to take your cover off and put it back on as well as prevent it from being damaged during severe weather. A typical cover weighs 50-100 lbs and it can be awkward to maneuver especially if the deck is slippery. A hot tub cover lifter is worth every penny and here's why. It allows one person to safely removed a cover without straining your back, and it's especially hazardous removing a heavy cover if the walking surface is wet and slippery. A quality hot tub cover lift comes with gas assist springs for effortless removal and comes with a caddy to store the cover neatly beside the hot tub during use. A cover lift is a great investment for any spa owner that wants to enjoy the convenience of an attached holder for your cover. A lift will turn the chore of removing the cover into a quick and easy task. Lift caddies are designed to work with almost any existing hot tub and can be installed in as little as a few minutes. They attach to the outside wall of your hot tub quite easily and most models have an under-cabinet design so it can be conveniently stored during use. The arms of the lift are often adjustable to suit different thicknesses so you can be sure that it works with your unique cover. If your hot tub is situated where you experience high winds, you may find a straps very useful. There is nothing worse than coming home or going for a soak only to find that your cover has been blown into the neighbours yard or flipped upside down in a pile of snow. A great idea is a locking clip that will keep children and even neighbours out of your hot tub when you aren't around. A cover cap is technically a cover for your cover. It's designed to be easy to put on and take off and will prolong the life of your hard top cover. It's ideal when you aren't using your hot tub for extended periods of time for added protection against harsh weather. The often come with elastic hems so it fits snug and won't allow anything underneath. Most hot tub covers are built to withstand several years of use with an industry standard of 5 years warranty. Look for quality materials and ensure you have the right size for your hot tub. With a proper cleaning and maintenance you can expect to have your cover for many years and pay for itself in just a few.